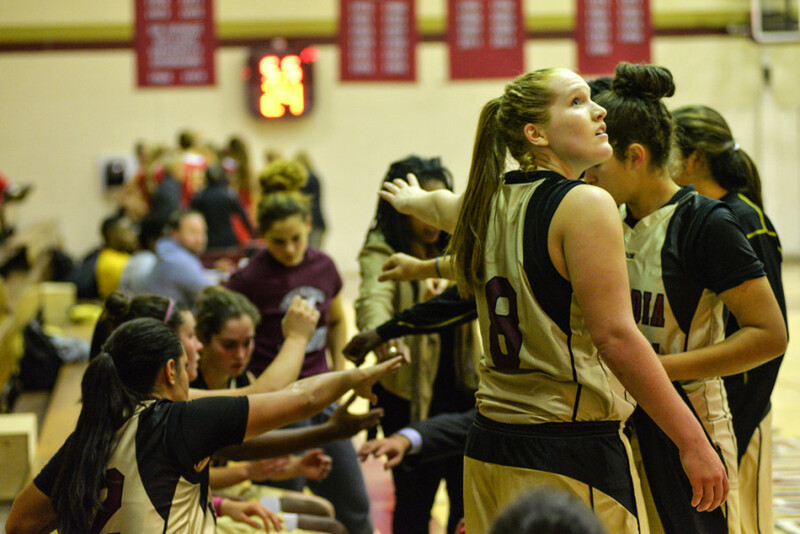 Following a particularly physical game against the UQAM Citadins last season, Stingers women’s basketball head coach Keith Pruden quipped that his opponent had the makings of a rugby team. Fast forward to their season-opening loss against the Laval Rouge et Or this past Thursday night and Pruden’s team found themselves in another physical—and foreign— sport. Even if his team isn’t in midseason form quite yet, Pruden’s post-game interviews are quite close. The Stingers women’s basketball team dropped their season opener against the Rouge et Or, 72-65, in the Concordia Gymnasium this past Thursday evening, but the story from the game was the Stingers shooting 18 per cent from the floor in the first half. Coach Pruden believes that had a lot to do with the referees not giving out many fouls to the Rouge et Or in the opening twenty minutes of play. Pruden pointed out that the Stingers only had two free throw attempts in the first half, despite finishing the game with 23. “How does the referee change so much between the first half and the second half, where a team takes two free throws in the first half, and 21 in the second half?” said Pruden. Despite the frustrating lack of calls from the referees, Pruden wouldn’t go as far as to blame them for the Stingers’ loss. Stingers forward Marilyse Roy-Viau, who scored a game-high 23 points in the loss, agreed that the referees weren’t up to standard but refused to use that as an excuse. “We hoped that the ref would’ve been a little more on our side, but that doesn’t mean anything,” said Roy-Viau, who also had four rebounds and three steals in the contest. The Stingers were only down 11-9 in the first quarter before allowing 22 points in the second. Concordia players weren’t able to capitalize on many of their shots in their first half, notably All-Canadian Kaylah Barrett, who ended the first half with only five points. Concordia found themselves down by 17 points in the third quarter, their largest deficit of the game. They attempted to claw their way back in, but only got as close as four points. With a little over a minute left in the game the Stingers tried to keep momentum going, but Barrett unfortunately mishandled and turned the ball over to Laval, all but giving the game to the Rouge et Or. The Stingers will host their next game against the Bishop’s Gaiters on Thursday, Nov. 13.